Not a bug per se but I wonder if it is possible to reduce or ideally elliminate periodic stuttering/freezing that occurs when moving close/inside a nebula. For example when I am moving at 1 ly/sec close/inside a nebula there is periodic stuttering with a period of about 1-1.5 second. In-between the stuttering there is normal/acceptable frame rate (~30-60 fps). I am running in Nvidia surround mode, using 3x1920x1080 displays with a fullscreen resolution of 5760x1080 but the issue also occurs in single display fullscreen mode (1920x1080). I am including my se.log and main.cfg if that is of any help. I have also disabled Threaded Optimization as suggested above for Nvidia users but with no benefit. What is you're GPU and CPU? I have been attempting to alter a system procedurally generated for Proxima Centauri. I exported the system, edited the .sc (deleted undesired objects, tweaked some others), then added the modified script to the planets catalog, changing universe.cfg to load Proxima.sc accordingly. 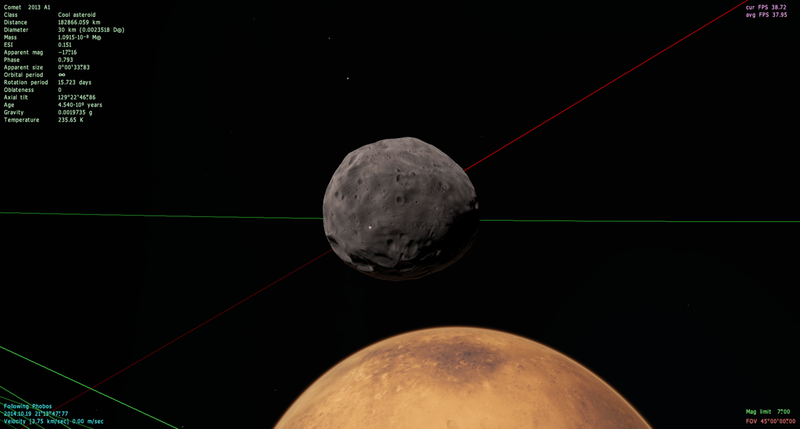 When I reopened SpaceEngine, the original procedurally generated system was still in place. Nothing changed. I turned off procedurally generated planets for catalog stars—still no change. The changes were slight: I removed the gas giants, reorganized some moons, changed the distance of the outer ringed Titan to 1.1 AU (from I believe 1.89), but kept most everything else, including the comets and asteroid belt, in place. Have I missed something about modding star systems? Or can't procedurally generated systems be modified once they've been generated? This. From the trouble shooting thread. When ever I get near an object with the Gravitational Lensing Effect (White Dwarf, Black Hole, Neutron Star, ECT.) The program crashes. Please Help! AidanBionicle1, look at the top of this page. While you do have a very powerful GPU/CPU combo that resolution you're running SE at could be a bit too much for your system. Besides evaporation trails resolution is the biggest performance killer for SE. Thanks, but the issue (the periodic stuttering/lags) occurs only when moving near/close to nebulae and at lower resolutions too (1920x1080). Download Space Engine yesterday and patch 0.9.7.3. I have unchecked procedural stars and planets and procedural planets under catalogue stars. The procedural planets under catalogued stars still appear in the tables. Is this normal? If so, can they be removed? Yes. The menu only affects the rendering of these objects, not their generation. If so, can they be removed? No. Also, I think you're posting in the wrong version's thread. Also can anyone give me step by step instructions on how to download a mod or addon because "drag files into SpaceEngine directory" is too vague for me. That doesn't sound at all vague to me, as those words can mean only one thing. Anyway, if you're having issues installing or using a mod or addon, you should ask the mod author. you only installed the 0.9.7.3 patch but you need SpaceEngine 0.9.7.2 before you install the patch. Alienasa, this is the wrong thread. If you came here via a link, let me know which one and I'll fix it.